I mentioned earlier that I'd visited a second memorable historic site in my vacation last month. 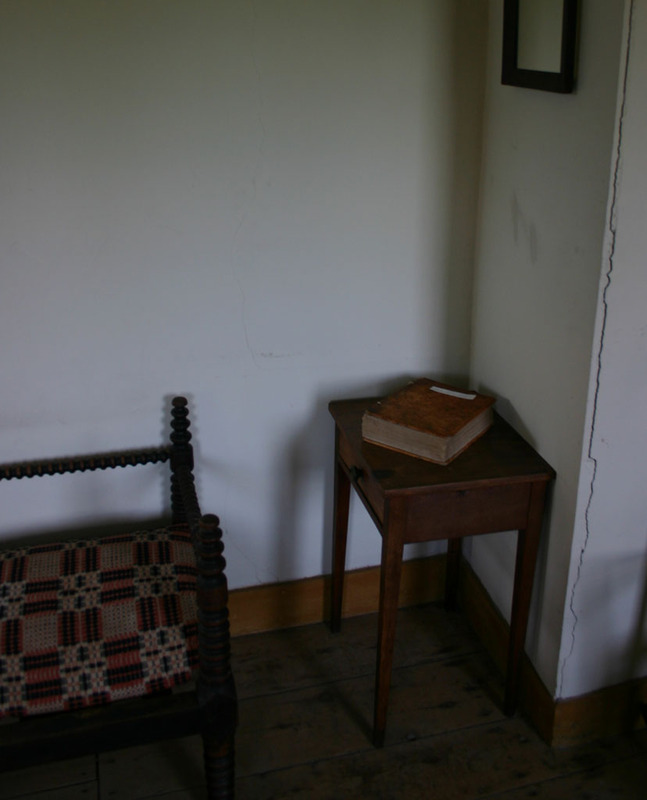 Again, it is memorable for being troubling: the home and farm, now a museum, of abolitionist John Brown. John Brown's house, North Elba, NY. Display at John Brown House. 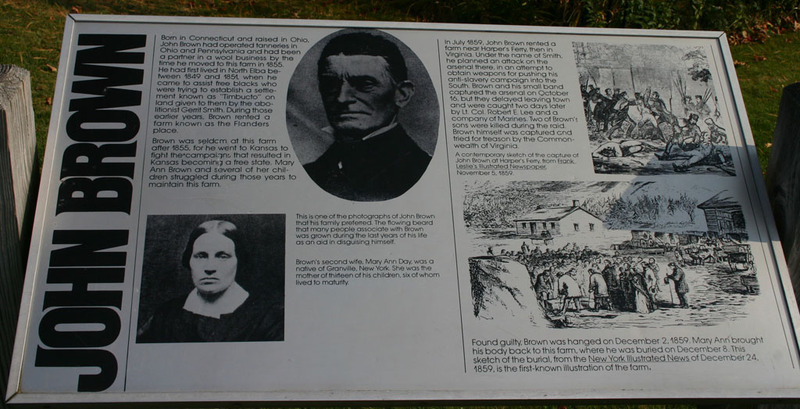 John Brown moved to North Elba to help a group of black families who were trying to establish farms in a place that today supports very few farms. He wasn't home very often, as he was usually fighting his battles elsewhere, but his wife and daughters lived there and he and many of his family members are buried there. Brown met his end in Virgina after he, his sons, and a small group of men seized the federal armory at Harpers Ferry, planning to arm slaves and free them. Despite a promising start - only a watchman guarded the armory - they were quickly at war with the surrounding countryside and arrested after various battles on the third day of their seizure. Brown was wounded, captured, and tried a month later. Found guilty on counts of murder, conspiracy, and treason (against Virginia), he was hung on December 2nd, 1859. That isn't exactly an unusual defense for a political prisoner, though it stands out against the background of Brown's prior work as a veteran soldier - an armed soldier - for abolition. This part recognizes the frequent difference in treatment between those who fight for those in power and those who fight for the powerless, and may be the strongest part of Brown's speech. This paragraph brings us to a common reason for violence done in the Lord's name. The world is not as God says it should be, so it's up to people like John Brown to make it that way, martyring themselves in the process if needed. The guide at the house emphasized Brown's religious motivations, talking about his encounters at the age of 12 that conflicted severely with what he'd learned in church. Bible at John Brown House. But do Brown's lofty ends justify the means? His reading of "do unto others" seems to imagine a future world, not his present one, and Brown seems clearly more interested in justice as an end than any sense of justice that might apply to the means he chose to arrive there. While I don't think Brown's strongly Calvinist background is a simple explanation for his choice of violent means, he certainly applied the Golden Rule very differently than Quakers would be likely to do in similar circumstances. I, John Brown, am quite certain that the crimes of this guilty land will never be purged away but with blood. I had, as I now think, vainly flattered myself that without very much bloodshed it might be done. Despite their different approaches, Quakers were very interested in Brown, and I'll have more on that in another entry soon. I've been meaning to see John Brown's house every time I am in the Adirondacks (which is not often). There's a lot about Timbucto (the free black community in North Elba) in John Stauffer's book "The Black Hearts of Men."